...and he’s on it: "Testing... one-two. Is this thing on?" "Testing... one-two. Is this thing on?" I could go on, ad nauseam, as to why this space has been silent for the past months but, really, who cares?! Right. Let's move on. What up, peeps? It's been TOO long. So... the natural question is, what's gotten me off my arse? Simple. 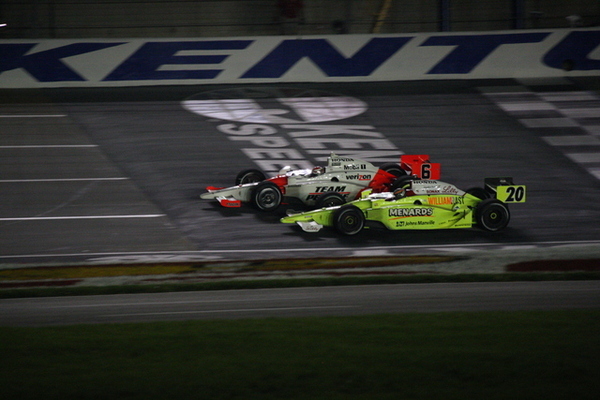 Just one of the most epic IndyCar events on the calendar--Kentucky Speedway, 2011, of course. Continually one of the most competitive venues, conveniently located near casa Montona, and rumored to be a question mark for 2012; all reasons why it's only right we dedicate some semi-well-thought-out keystrokes. So, I pulled "The Man" into my office (I don't have an office) and advised him not to look for my sad mug till Tuesday, next. That means the next days are just you, me, and the big bowl in the Bluegrass--condolences. Crackberry in hand, we'll be boots-on-the-ground, all weekend, doing our level best to share all the excitement with those unable to make it to what could be the last go-round for Kentucky on the IZOD IndyCar schedule [insert well-chosen expletive here]. Herewago! Pending adequate cell coverage, expect copious tweets; vivid, .3 megapixel pics; and as many posts, here, as we can squeeze out [insert low expectations here]. Glad to read you again. That finish should have knocked the cobwebs off of anyone that still has a pulse. Welcome back, I hope its not a brief stint.